TRIPPLETIMER | “Trippletimer” is a crocheted bolero that I named after the Spanish dance in triple time. It is a basic bolero construction of one piece – from the bottom up. 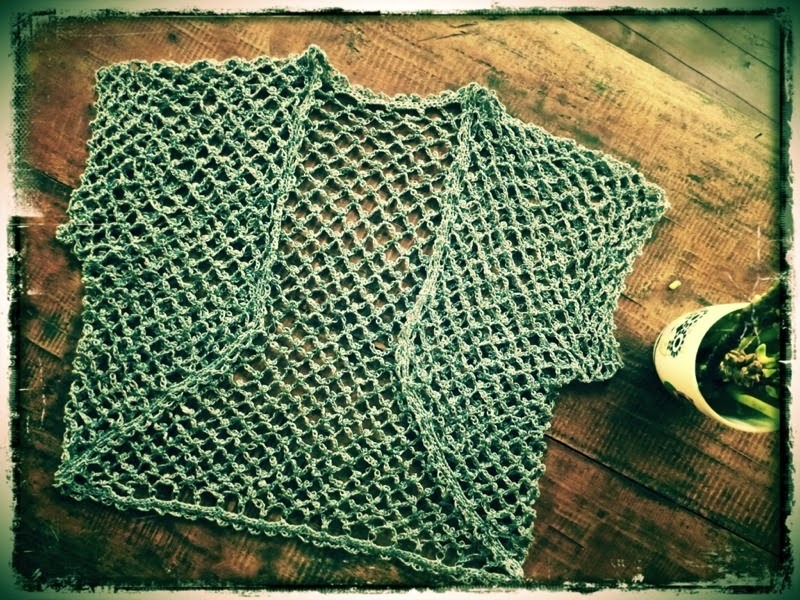 The intention in this pattern is to begin with something basic, then to modify in little sections (such as the edging and sleeves) and then larger modifications (such as using a different openwork stitch for the body of the bolero). I hope that “Trippletimer” encourages you to modify, improvise and begin making your own bolero design. 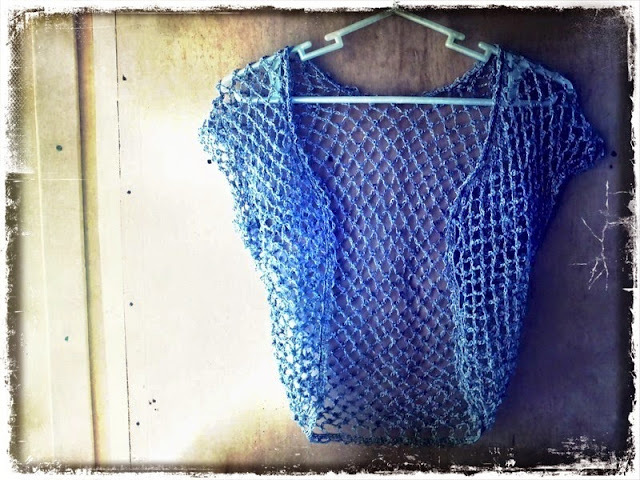 “Trippletimer” is a bolero made from the bottom up as a single piece, dividing into three to make the armholes and then seaming together at the shoulders. 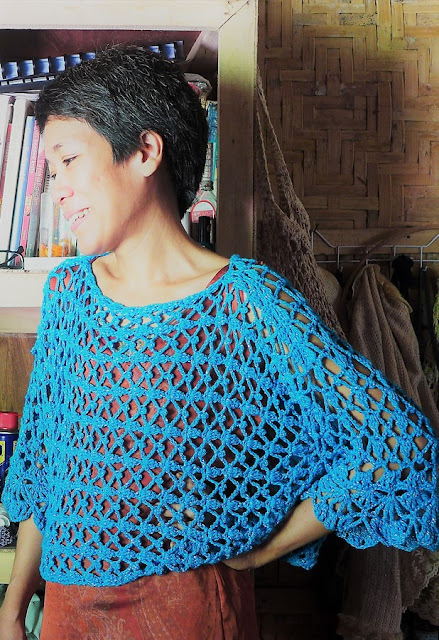 It is one of the most basic garment constructions in crochet. A basic openwork stitch is needed for patterns of this kind. It should be a stitch that can be increased at both sides. The openwork stitch used here is the Trellis Picot Stitch (ch 7, sc in next loop, picot) – it is an openwork stitch in the shape of diamonds with a picot in each diamond. The first several rows are worked in increasing stitches to shape the curve of the front edges of the bolero, then the next rows are worked in straight stitches up to the armpits where the piece is then divided into three: front left, front right and back. One, three or five loops – depending on the size – make up the armholes. When the suitable length – again depending on size – is reached from armpit to shoulders, the front left and right are seamed to the shoulders. A finishing is made by crocheting two rounds of sc all around the edges of the bolero, with a final round of simple crochet lace trimming. Five rounds of a slightly smaller version of the basic openwork stitch is worked around the armholes to make the cap sleeves. The easiest way to modify the pattern is to vary the trim around the edges of the bolero and the sleeves. The second way to modify the pattern is to use your own openwork stitch instead of the Trellis Stitch with Picot. Other modifications can also be made such as making longer sleeves, using buttons or ties, etc. for as long as you are keeping to the size you require. Picot: Ch 3, sl st in base st (sc in this pattern). Picot made. Note: You can adjust the size of the bolero by starting with the foundation chain of suitable length. It is in multiples of 5 chains. Row 1: Ch 105. Sc in 15th ch fr hook. Ch 7, sk 4 ch, sc in next ch (this completes a Trellis Picot Stitch); rep fr * to make 19 loops; ch 14, turn. Row 2: Sc in first loop, picot, *ch 7, sc in next loop, picot; rep fr * and finish by working the last loop with: ch 7, sc in 3rd ch of loop, picot, ch 7, sc in 8th ch of same loop; ch 14, turn. Row 3-16: Rep row 2. You should have 35 loops at the end of Row 16. End the row with ch 7; turn. Row 17: Sc in first loop, picot, *ch 7, sc in next loop, picot; rep fr * on all loops; ch 7, turn. Row 1-18: Work (sc in next loop, picot, ch 7) on first seven loops; ch 7. End last row with sc in last loop. Fasten off. Row 1: Join yarn to 7th to the last loop on other side of the bolero. *Ch 7, sc in next loop, picot; rep fr *; end row with sc in last loop. Row 2-18: Work (sc in next loop, picot, ch 7) on first seven loops; ch 7. End last row with sc in last loop. Fasten off. Back Piece: Work 18 rows of the trellis-picot stitch in the middle loops leaving one loop unworked for each armhole. When you reach the last row of the back piece, join to shoulders of left front and right front pieces. Fasten off. Edging: Work two rows of sc all along the edges of the bolero as follows: work 6 sc along the edges of rows 1-16. Work 4 sc in the rest of the loops. For the third row, work as follows: sc, ch 3, sk 1 sc, sc in next sc, all along the edges. Fasten off. Sleeve: Join with sc to sp at armpit and work all around the armhole three rounds as follows: *ch 5, sc in next sp, picot; rep fr * all around, end with ch 2, dc in first sc made. Ch 1, sc in dc, picot, ch 5, sc in next loop, picot; rep fr * all around, end with ch 2, dc in first sc made. Repeat this round one last time to make 3 rounds. Begin round 4 as follows: Ch 1, sc in dc, *ch 4, sc in next loop, picot; rep fr * all around; end with ch 1, dc in first sc made. Then continue the last round as follows: *ch 3, sc in next loop, picot; rep fr * all around. Fasten off. Weave in all ends and block to measurements. Row 1: Ch 115. Sc in 15th ch fr hook. Ch 7, sk 4 ch, sc in next ch (this completes a Trellis Picot Stitch); rep fr * to make 21 loops; ch 14, turn. Row 2: Sc in first loop, picot, *ch 7, sc in next loop, picot; rep fr * and finish by working the last large loop with: ch 7, sc in 3rd ch of loop, picot, ch 7, sc in 8th ch of same loop; ch 14, turn. Row 3-18: Rep row 2. You should have 35 loops at the end of Row 16. End the row with ch 7; turn. Row 19: Sc in first loop, picot, *ch 7, sc in next loop, picot; rep fr * on all loops; ch 7, turn. Row 1-22: Work (sc in next loop, picot, ch 7) on first seven loops; ch 7. End last row with sc in last loop. Fasten off. Row 2-22: Work (sc in next loop, picot, ch 7) on first seven loops; ch 7. End last row with sc in last loop. Fasten off. Back Piece: Work 22 rows of the trellis-picot stitch in the middle loops leaving three loops unworked for each armhole. When you reach the last row of the back piece, join to shoulders of left front and right front pieces. Fasten off. Begin round 4 as follows: Ch 1, sc in dc, *ch 4, sc in next loop, picot; rep fr * all around; end with ch 1, dc in first sc made. Rep another round of the same. Then continue the last round as follows: *ch 3, sc in next loop, picot; rep fr * all around. Fasten off. Row 1: Ch 125. Sc in 15th ch fr hook. Ch 7, sk 4 ch, sc in next ch (this completes a Trellis Picot Stitch); rep fr * to make 23 loops; ch 14, turn. Row 3-20: Rep row 2. You should have 43 loops at the end of Row 16. End the row with ch 7; turn. Row 21: Sc in first loop, picot, *ch 7, sc in next loop, picot; rep fr * on all loops; ch 7, turn. Row 1-26: Work (sc in next loop, picot, ch 7) on first seven loops; ch 7. End last row with sc in last loop. Fasten off. Row 2-26: Work (sc in next loop, picot, ch 7) on first seven loops; ch 7. End last row with sc in last loop. Fasten off. Back Piece: Work 26 rows of the trellis-picot stitch in the middle loops leaving five loops unworked for each armhole. When you reach the last row of the back piece, join to shoulders of left front and right front pieces. Fasten off. Sleeve: Join with sc to sp at armpit and work all around the armhole four rounds as follows: *ch 5, sc in next sp, picot; rep fr * all around, end with ch 2, dc in first sc made. Ch 1, sc in dc, picot, ch 5, sc in next loop, picot; rep fr * all around, end with ch 2, dc in first sc made. Repeat this round to make 4 rounds. Begin round 5 as follows: Ch 1, sc in dc, *ch 4, sc in next loop, picot; rep fr * all around; end with ch 1, dc in first sc made. Then continue the last round as follows: *ch 3, sc in next loop, picot; rep fr * all around. Fasten off. Do you know approximately how much yarn would be needed for the large size? Thanks! Hi Nancy! You may need about 250 grams of yarn for the large size. I hope this helps! Yes! Thank you so much and have a lovely weekend!